Acatenango Volcano – The hike that nearly broke us! 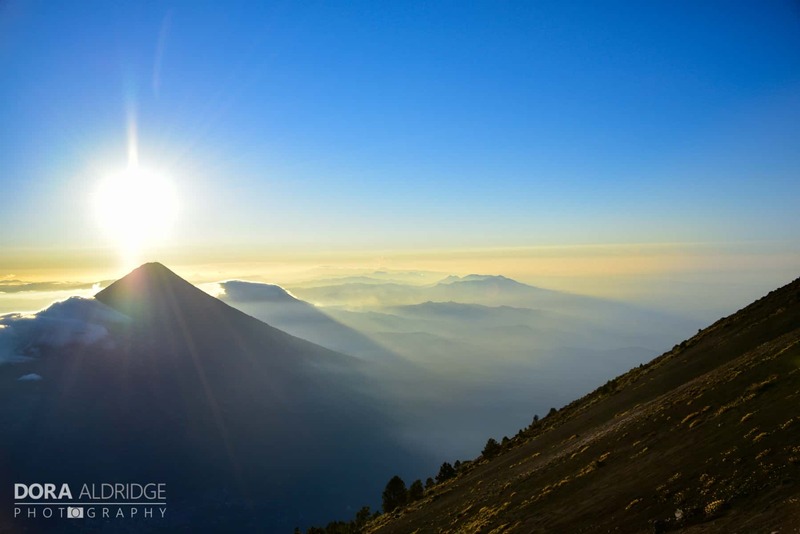 It has long been a dream of ours to glimpse an erupting volcano, so when we heard of hiking Acatenango Volcano; just outside Antigua, Guatemala we knew had to go! 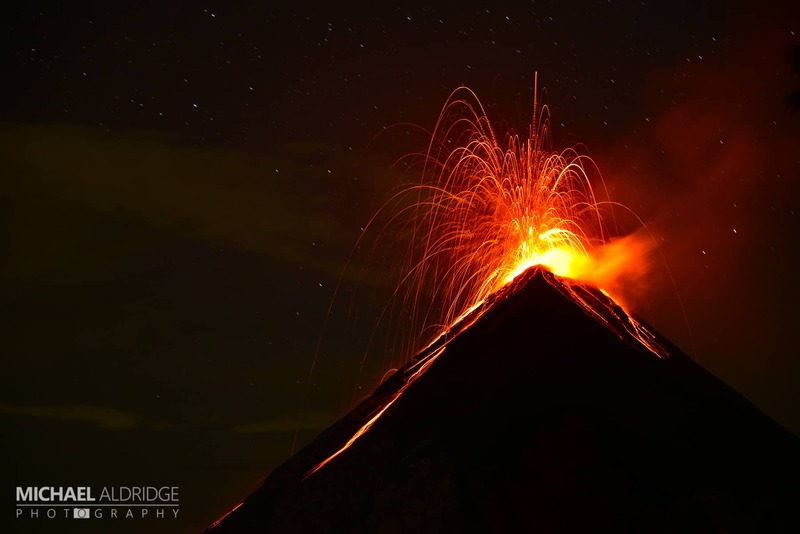 There is no better place to watch the majestic Volcán de Fuego (Volcano of Fire) erupt! 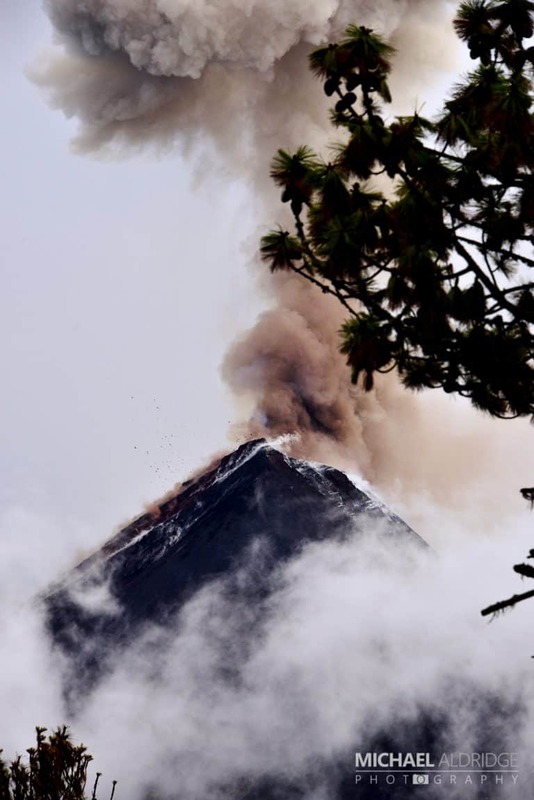 Volcán de Fuego is one of the world’s most consistently erupting volcanoes. However, we were completely unprepared for how utterly epic it was going to be. Hand on heart, this really was one of the most incredible spectacles either of us have ever seen. 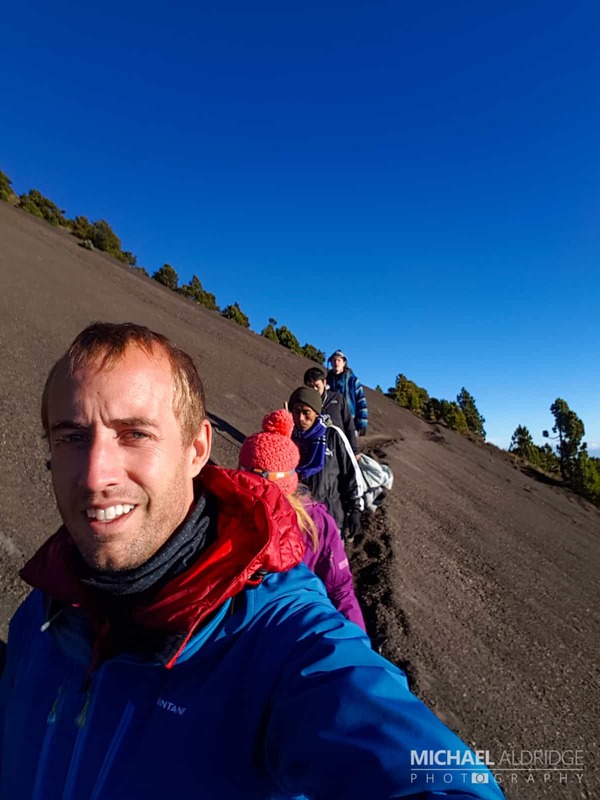 We considered the nearby trip to Pacaya Volcano, but from speaking with the locals, we learnt that Pacaya is no longer as active as the tour operators would have you believe. Once upon a time Pacaya had a lava river that you could walk right up to, but this is long gone. The Acatenango hike is where the action is! Our trip began at 7:30am on a lovely sunny day, we were picked up from the hotel and taken to Gilmer, our guide’s house at the base of the volcano. Here we were kitted out with a sleeping bag, roll mat and tent. This along with 3 litres of water, lots of warm clothes and snacks made for a surprisingly heavy backpack (see our suggest kit list below)! I’d never done a multi-day hike so despite only packing the bare essentials the weight was certainly a shock to the system. We were then driven to the bottom of a track (approx. 2000m) to begin our Acatenango trek at 9:30am. We were able to hire gloves at the bottom of the hill from a group of children (Q10 per item, also on offer were hats and wooden poles). We were a nice size group of 6, plus our wonderful guide Katalina Soy (Gilmer’s older brother). 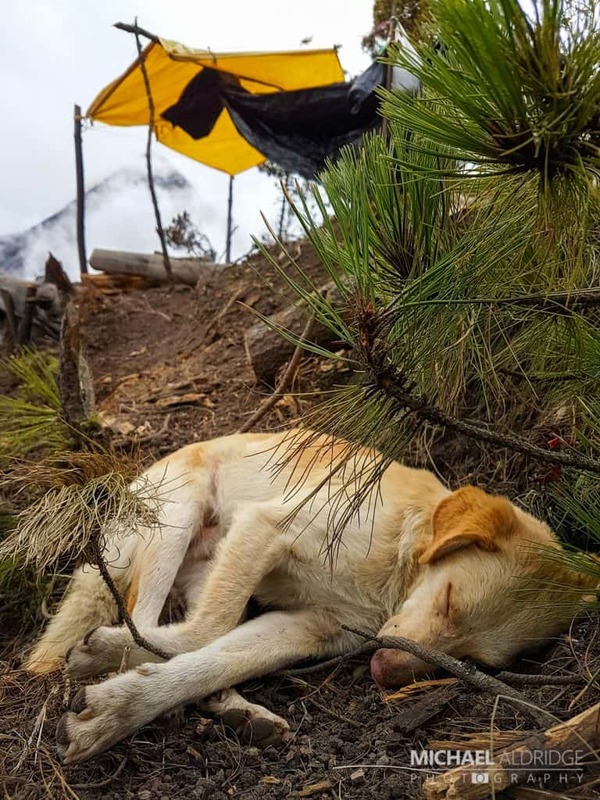 Tarzan the Volcano Dog kept us company the entire hike. Up, up and away we went! Holy cow it’s steep. In the first 30 minutes both Michael and I really struggled. Me with my asthma (que the inhaler I thought I’d take, just in case) and then Michael with the altitude and thin air making it difficult for him to get enough oxygen. I really can’t emphasis just how steep this trek is, our legs weren’t given a break the entire hike. The terrain is tough going, we started on dirt paths through the cornfields and forested areas. Further up we hit loose volcanic gravel, the kind that you really need to kick your toes into to get any grip! Hike group shot with Tarzan the dog! As we gained altitude and began to curl our way around the hillside, we began to hear the deep grumbles of volcanic eruptions. From this point we knew we were going to be in for an incredible night! Four and a half hours of gruelling climbing from start to finish, we reached camp and settled at 3,776m. Just leaving 200m to summit in the morning! It is a strange thing how people respond to high altitudes, it seems irrelevant how fit and healthy you are. But you are likely to be more tolerant to altitude if you are female and/or older. People will be affected at different heights, but above 2500m the effects become more evident. Michael struggled to reach camp, and once the tent was set up it took him nearly an hour become comfortable again. But what a campsite, the views were out of this world! We’d hiked above the cloud line and along with the altitude it seemed like we were aeroplane level. 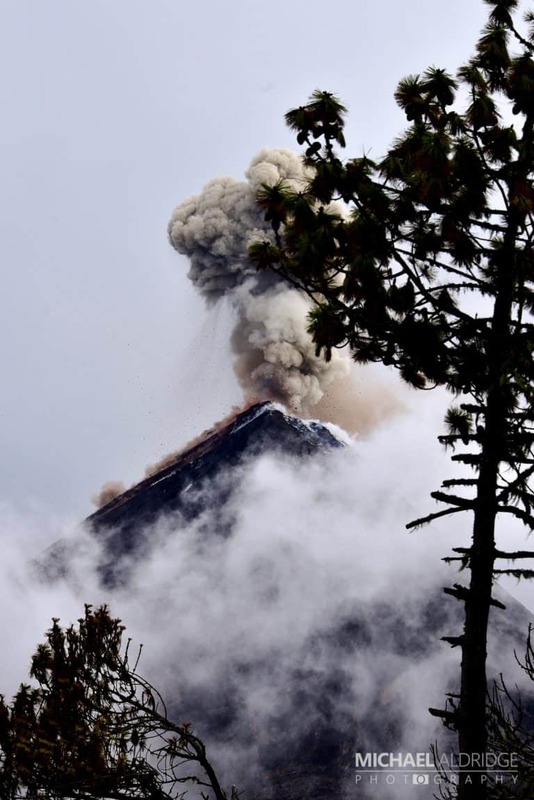 The sight from Acatenango was magnificent. Volcán de Fuego put on a mighty display. BOOM, a huge plume of smoke and a loud grumble. It’s hard to see the vibrancy of the lava during the daylight, but by darkness the red glow of erupting lava was intense. Watching a volcano erupt is like nothing else in the world. A totally unique experience. As the daylight subsided we huddled around the fire, captivated by Fuego erupting time and time again. 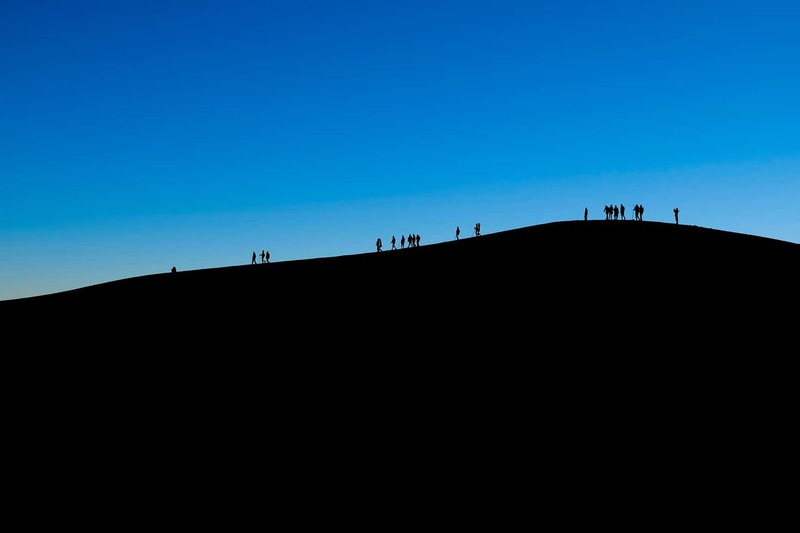 In the early morning, around 3:45am we woke up, and begun our hike to the summit to see the sunrise. Thankfully this time it was only a mere 200m and without backpacks! Hurrah!… Disaster, Michael was immediately hit by the altitude. After feeling all the text book signs of altitude sickness (it’s definitely worth looking these up before you go) and still trying to persevere, his vision started closing in at around 3,920m. Katalina was great at giving encouragement, but this was Michael’s limit. Stopping where we did wasn’t such a bad thing though, we got a beautiful and sheltered little spot for just the two of us. There are honestly no words to describe how stunning this sunrise was. As we began to descend, Michael immediately began to recover. Thank goodness. It was so much fun as we raced/skied down the volcanic slopes back to the camp. Breakfast done, it was now 8am and time to hike down the mountain! Thankfully this was much easier, only 2.5 hours of leg burn this time. Our time on Acatenango was truly one of our most memorable moments to date. 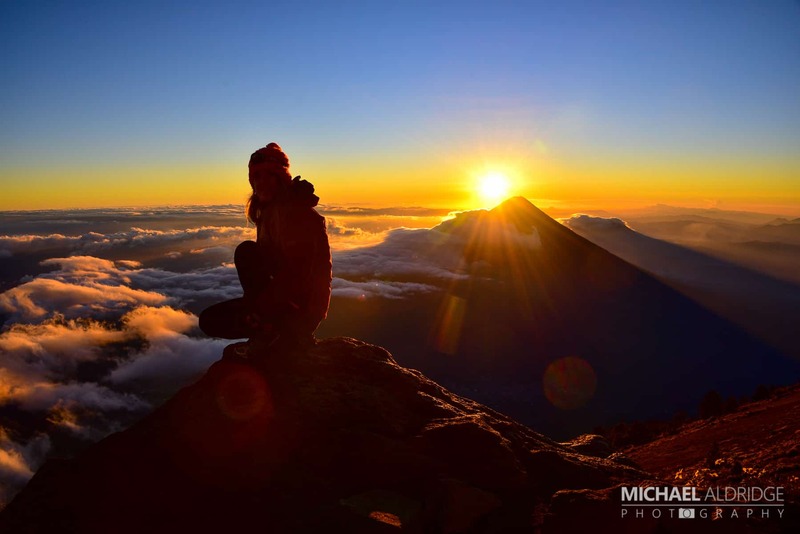 Between the sunrise and watching Volcán de Fuego erupt over and over simply has no words. The whole experience has been such a privilege. Just so incredibly epic and special. 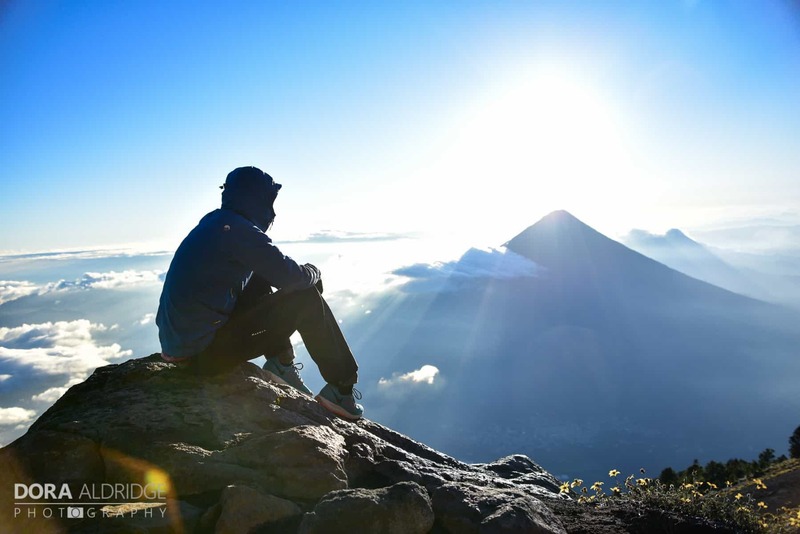 We’d love to hear your thoughts on hiking Acatenango, have your say in our comments section below. Do not underestimate this trek, it is a serious endeavour. I would consider both of us very fit individuals – but this nearly broke us! Everyone struggles, so don’t feel bad if you need to take a break. The trek is perfectly safe with the correct guide, however we have heard that some of the bigger companies cut corners by increasing the number of tourists but not the number of guides. Be very wary of this, there are horror stories of lost tourists, frost bite and even death! 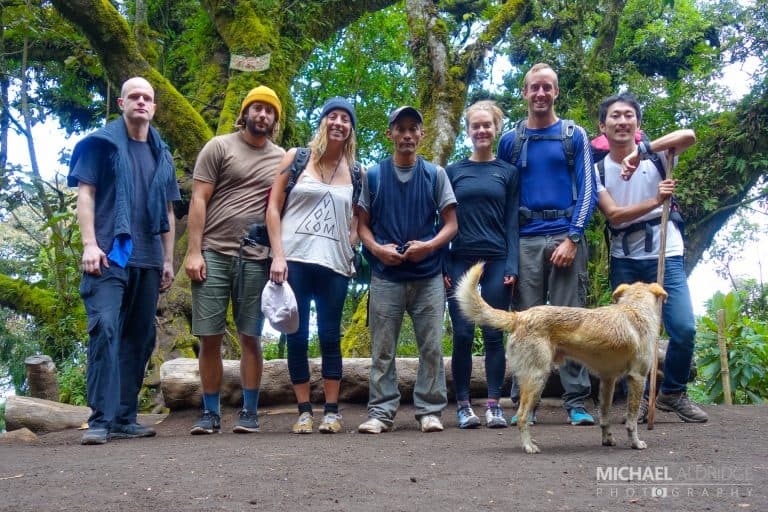 We chose to hike Acatenango with a lovely chap named Gilmer Soy, and his brothers. This started as a recommendation from a couple who did the trek a couple of weeks before. Googling the trip on TripAdvisor I knew we had chosen well, treks with Gilmer rate incredibly highly and he’s personally named. I also liked the idea of hiking with a smaller group, as I felt we would be better looked after. Included in the price (Q300pp) were 3 meals, a reputable guide, sleeping bag, tent and roll mat. Gilmer, along with his brothers, rate safety incredibly highly and have so much exceptional knowledgeable and care for the area. 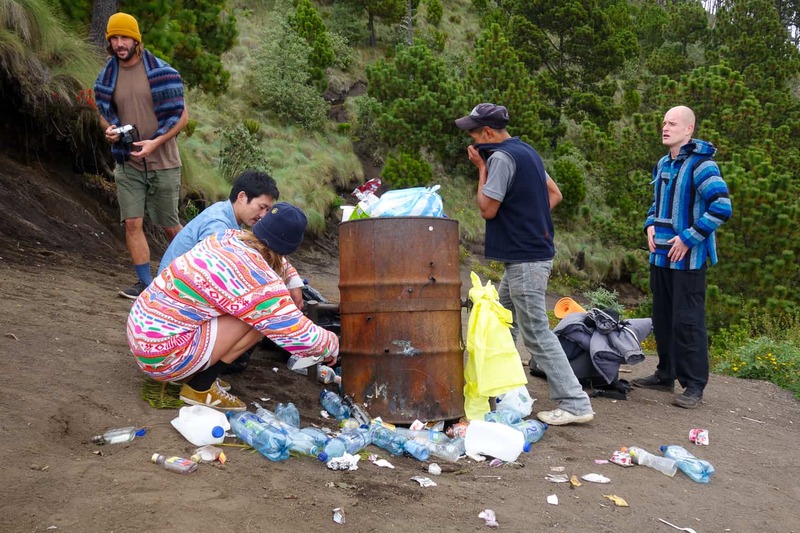 Taking the time to clean up the litter, which was left behind by other groups on Acatenango Volcano. With Gilmer’s company, the money you pay for the trip goes directly into the community. It may cost a little more than some of the other tour companies, but we were more than happy to spend our money here knowing that it goes to such a good cause. Gilmer has big plans for the town he lives in, he has already worked with the government to install electricity, running water and a sewage system. The community are currently saving money to pay for a new school, and at present all the money collected from the treks are going to this cause. Also, if you need another excuse to use Gilmer, he has also been selected to be the guide for a certain famous survivalist (sounds like Bare Grills) for an upcoming episode. We cannot recommend Gilmer enough, you will get the best experience on the mountain and all for a great cause. It is a tough hike and you will curse any unnecessary equipment you bring along, but likewise it can be cold/wet/windy up the mountain so make sure you are prepared. This is what we would recommend if decent weather is forecast. Snacks; bananas, trail mix, jelly sweets, biscuits etc. PrevOlder AdventuresCanada, You’re So Beautiful! You have an incredible talent for writing and your husband for photography. 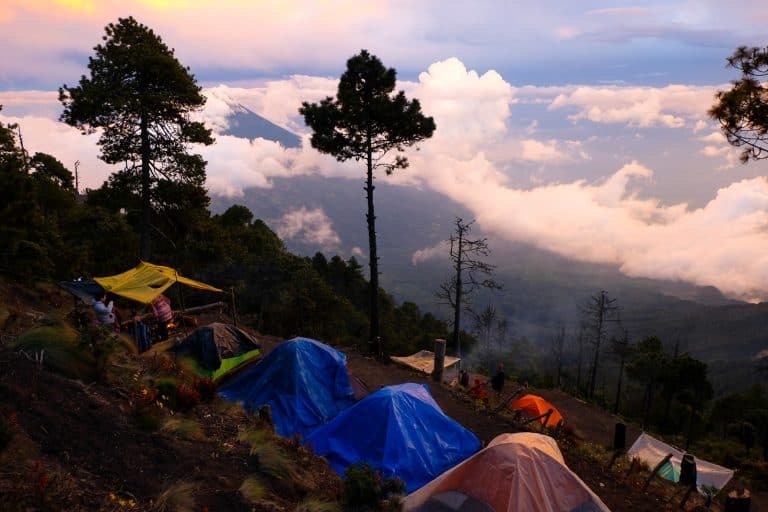 So happy I stumbled upon this site – it was your blog post that convinced me to go for the overnight backpacking trip to Acatenango (next month!). Thank you for sharing your experience, and I look forward to following the two of you on your travels! Lily, that’s so lovely of you to say, thank you! You absolutely won’t regret the hike, it’s the most incredible and rewarding thing I’ve ever seen – still at the top of our list of all the things we’ve done while travelling! Your photographs bring me right back atop the volcano! Hiking Acatenango was the most rewarding outdoor activity I’ve ever done. I also found it strange how differently altitude hits certain people. I’m not terribly fit and I barely felt it apart from a slight dizziness while one of the guys in my group did half-iron mans all over the world and he got sick as a dog. Crazy! How long did the hike take overall? I have a trip planned to Guatemala, but unfortunately very few days. 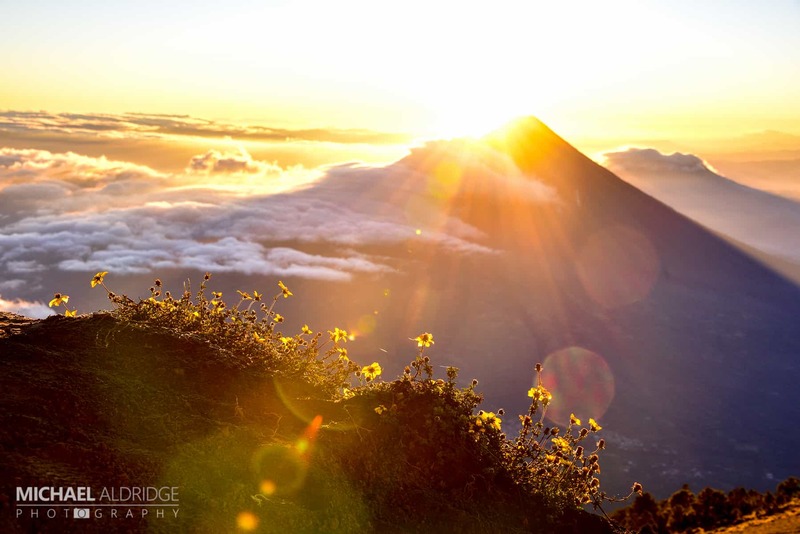 If you are in Antigua you have to make time for this trip; it is not only the best thing to do in Guatemala, it is one of the best things we have done anywhere in the world. I just hope you get the same light show and weather that we did. In total the trip is about one and a half days, you start early in the morning on day one, camp near the top over night, then an early start the next day for sunrise. If you have a reasonably fit group, you will be off the volcano about midday and back in Antigua shortly after. I do hope you can make time for it. Only other advice I would give, is do some research on climbing at altitude and symptoms of altitude sickness. We are at high altitude now in Bolivia and did a bunch of research before arriving (naively we didn’t do so for Acatenango). Not to put you off, because it is totally worth it, but it is a serious undertaking hiking at this height without properly acclimatising. Gilmer’s one of the best guides on the mountain and will give everyone as much time to rest as needed, but still I don’t know that they realise it isn’t a mind over matter thing. Thanks for the information Michael! My trip is 8 days, and I’m trying to organize it so I can be an antigua, lake Atitlan, do this trek and go to Semuc Champey. Wish I had more time. I was in Peru a couple months ago, trekking near the Cordillera Blanco and luckily had no altitude problems, being way up at laguna 69 4500m. So I’m hoping i won’t have any problem with this one. Your pictures are breathtaking, I really hope it’ll be as beautiful! Thank you so much for posting this well-written and complete post! I was looking through TripAdvisor, and found out how reputable Gilmer Soy is. But since I want to read more about the guy, I’m glad that you posted this! I just finished my hike, and I used Gilmer Soy agency! Literally the BEST decision I’ve ever made during the trip. His family (who are the guides) made the trip so much bearable, and I know I couldn’t make it to the top without them. Great photos, by the way! Hi, I am planning a trip at the start of next year, and read a lot of great reviews. How far in advance do you recommend booking the trek? We are taking a trip at the end of Feb. I would really love to do this hike. Do you know if they allow kids? I have an 11 year old who might be with us.